The central staircase is topped by a frameless skylight. 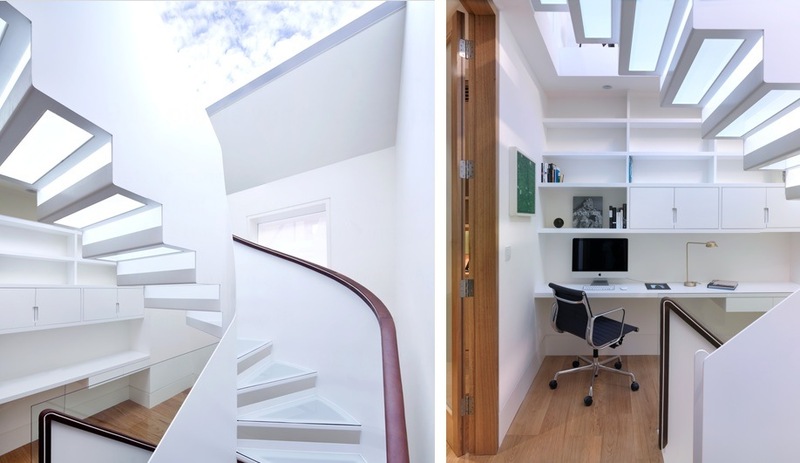 An office space tucked beneath the stairs takes full advantage of the natural light. 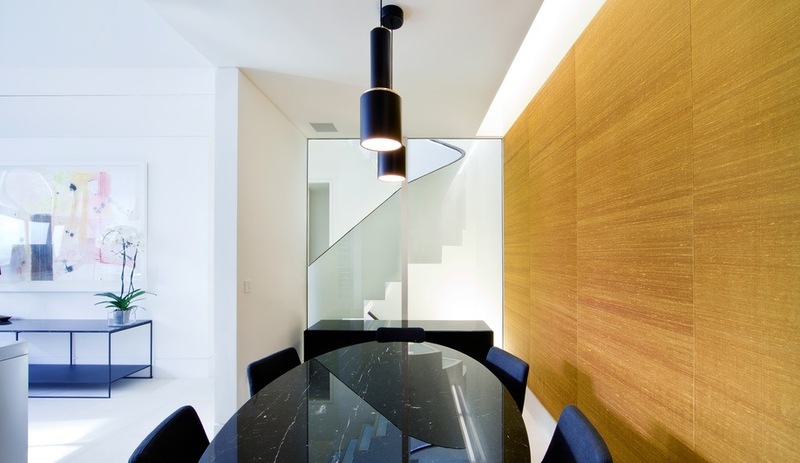 Frosted glass treads allow light to reach all the way into the expanded basement. 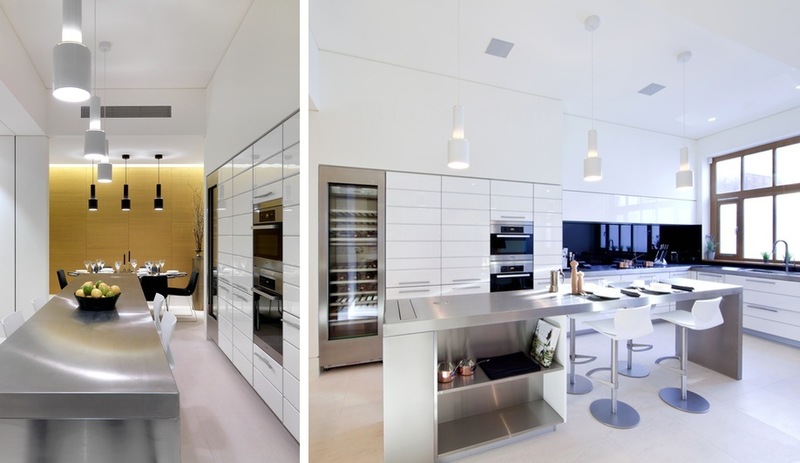 The interior renovation includes a gleaming ultramodern kitchen by Shiffini. Custom glass enclosures can be found throughout the house, like this wall that admits light from the stairwell into the dining room. 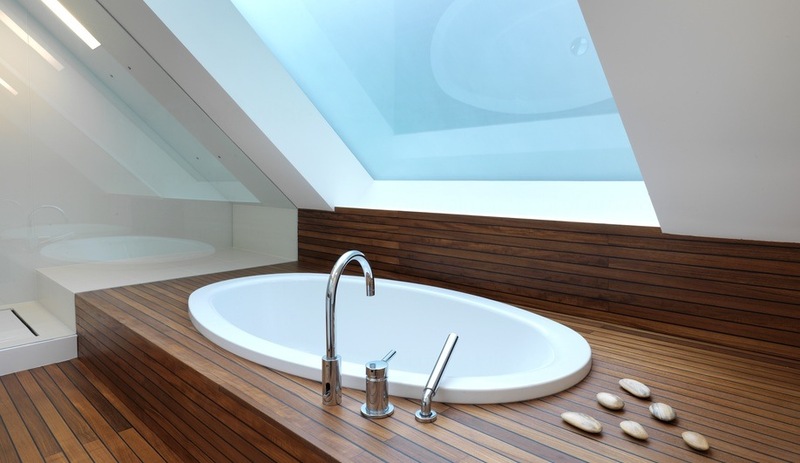 A second frameless skylight drenches the master bathroom in daylight. Tara Logic faucet by Dornbracht. Although the interior was greatly expanded, the architects were able to retain the original Victorian facade. While the living area has windows along only one wall, the stair acts as a light well channeling sun to both sides of the building. 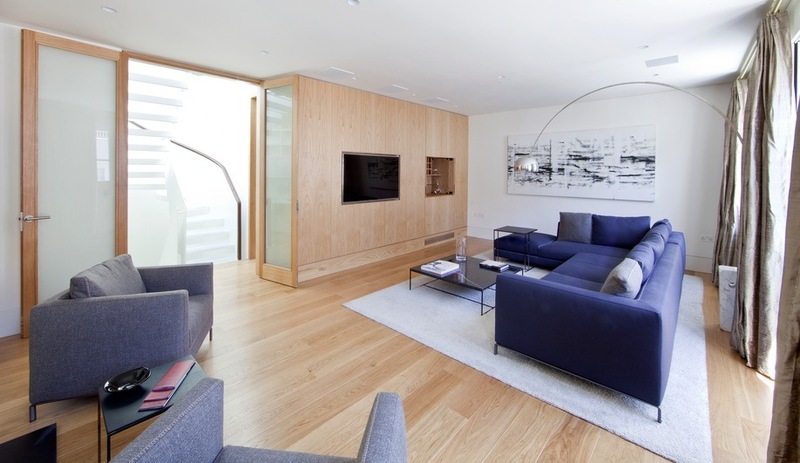 Seamless custom oak joinery maintains the clean aesthetic. 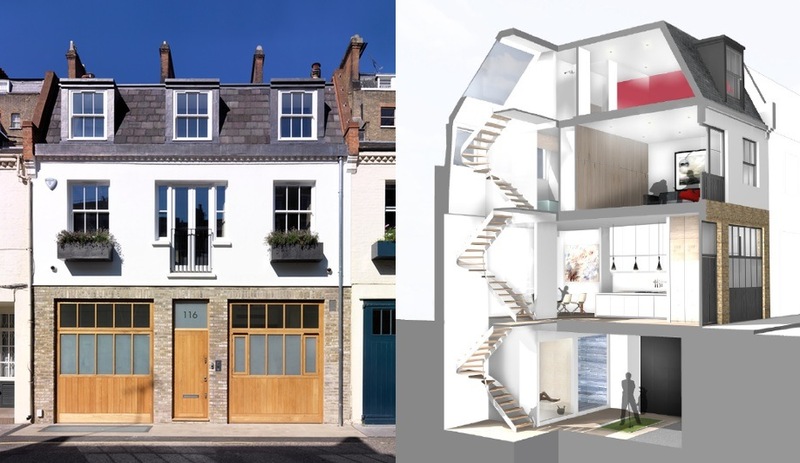 Working with a heritage building in a constrained site, Threefold Architects create a vibrant home in London that ushers the sun’s rays from a dramatic skylight all the way down a transparent staircase. 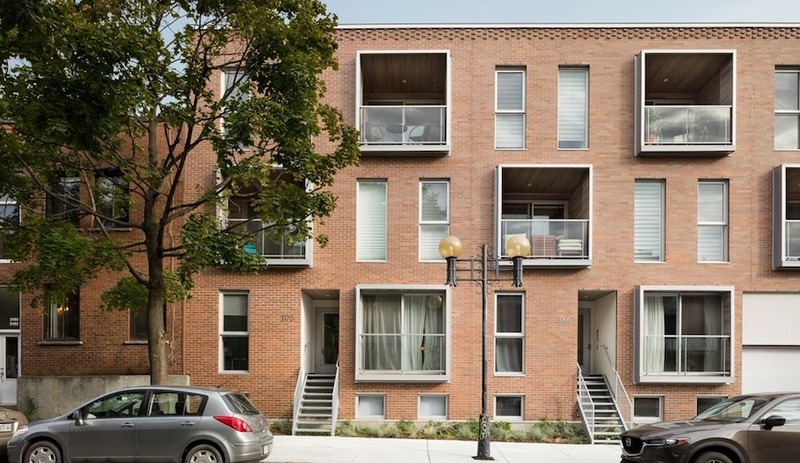 When Threefold Architects began an expansion to a Victorian-era row house, they found themselves confronted with multiple constraints. 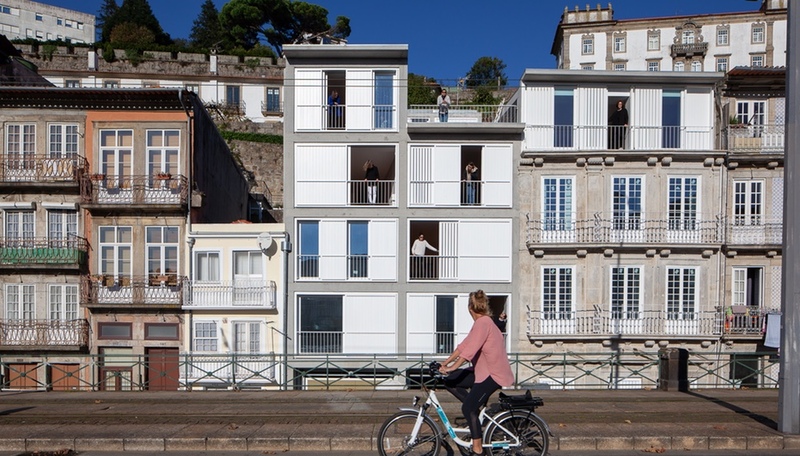 Not only is the structure boxed-in by neighbours on three sides, but zoning and conservation restrictions also placed limits on how the architects could build out. 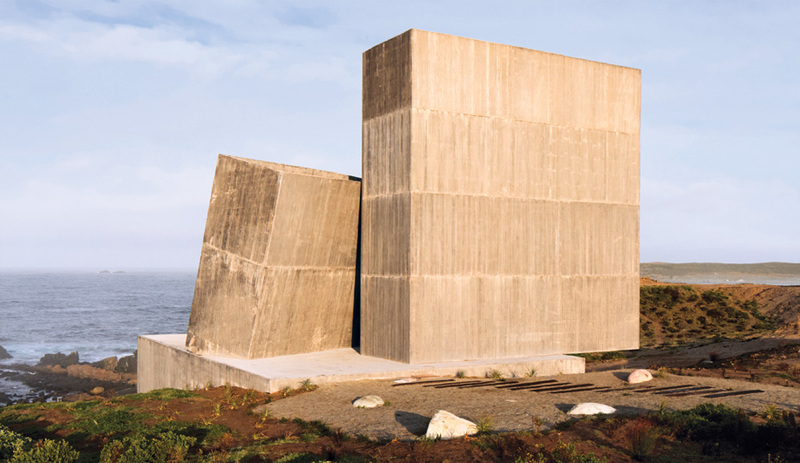 But with some ingenious manoeuvring, they were able to increase the floor plan by over two-thirds, and ensure that sunlight would reach windowless sections of the house. One of the most dramatic changes Threefold made was the addition of two massive frameless skylights to the roof. One is positioned directly above a three-storey staircase that leads from the basement to the master bedroom on the third floor. 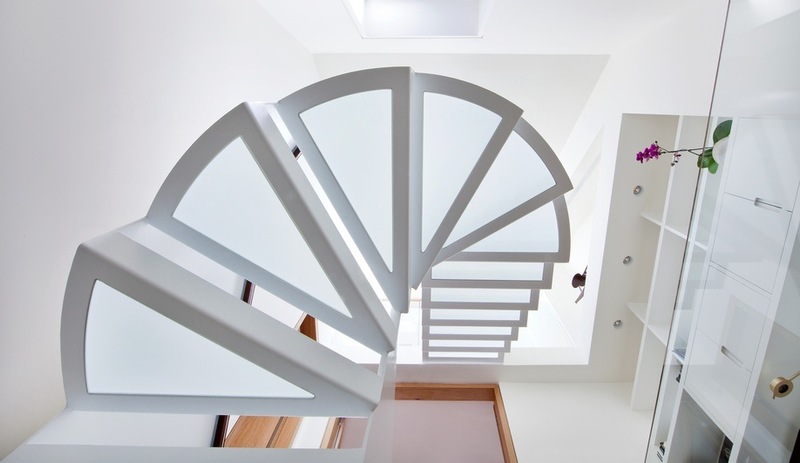 To funnel daylight deep into the basement, this stairwell is painted white and, rather than install the typical wall-mounted wooden treads used in residential staircases, the team opted for a floating spiral staircase with translucent glass treads supported by a narrow frame of white-painted steel. Positioned at the back of the house – a space that would otherwise remain dark due to a lack of windows – the slim and light-permeable stairs permit this utilitarian space to perform double duty as a light well. Threefold upped the interior volume while retaining the period facade and roofline by expanding both upwards, with the addition of the master bedroom suite to the former attic space, and down into an extra-deep basement. This strategy boosted the interior space from 185 to 254 square metres – reclaiming enough room from the subterranean level to accommodate a new bedroom, sauna and steam room, and even a golf simulator. 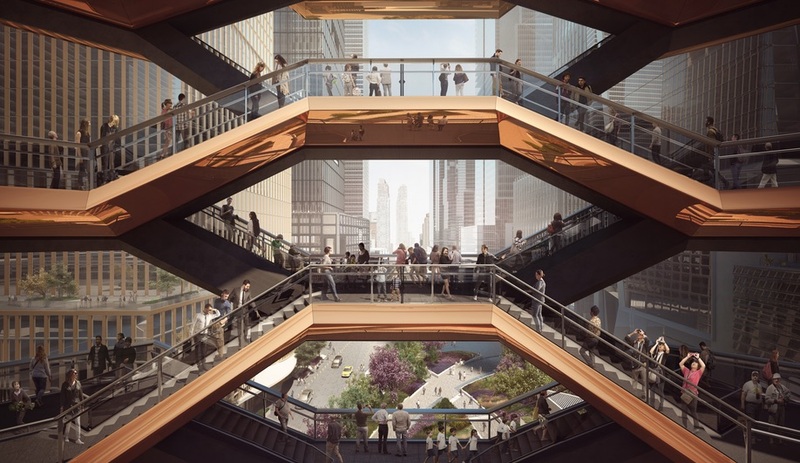 During this revitalization, the entire structure was wired with a technological nervous system of hidden controls, which allow the family to modulate everything from the indoor climate and security system to the television and lighting at the click of a remote. Combined with modern high-efficiency glazing and insulation, this technology enables efficient control of energy consumption, making the house much more energy efficient than it was after its 19th-century construction. For more innovative staircase ideas, check out page 98 of AZURE’s March / April Issue, now on newsstands.